The bathroom is, perhaps, the second part of your home that you give much notice, if not the first. And it is for good reason. It is one of the most intimate spaces in your house. The bathroom is not only a place for you to clean yourself. It is more often used to get refreshed, to relax, and ponder. That’s probably one of the reasons why some cultures call it “the comfort room”. A clean bathroom is not the sole criteria for comfort. Most people pour effort and money to make a space “look” and “feel” comfortable. The trend in bathroom design has shifted towards having bathtub doors over shower curtains and other shower kit enclosures. Besides preventing health risks related to PVC curtains, shower doors yield long-term durability with low maintenance. Not all doors are made equal. Picking the best bathtub doors is thus, requisite. 2 The Hottest Top 10 Bathtub Doors Right Now! There is a growing number of choices for shower enclosures to feed your confusion. It pays to know what types are out there and what to look for when choosing the best bathtub doors. Know your needs (and wants). Better, make a list of them. 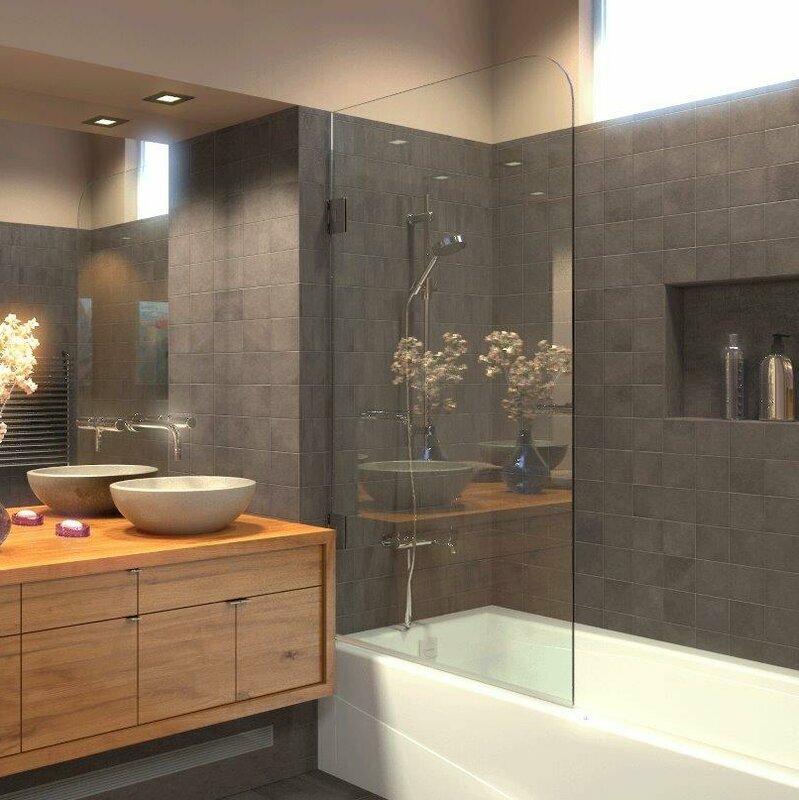 Knowing the space limitations, your taste, and the type of tub you have are among the important factors. Ask yourself these questions: Is there enough space for a door that swings out? Do I need an enclosure to hold off steam? Do I have a shower-tub combination? Do I need to cater to people with movement disabilities? Know the type that fits your bathroom space. There are mainly two types of glass doors in the market: pivot and sliding doors. Pivot doors, also called hinged doors, are those enclosures that open like a standard door. Some pivot doors swing in while others swing out. Swing-in doors do not need extra space outside of the bathing area. They allow for easy maneuvering for people with movement disabilities. Swing-out doors, on the other hand, require more space for the doors to open and close. Small bathroom spaces require either swing-in pivot doors or sliding/bypass doors. There are frosted and clear glass doors. There are also patterned or textured ones. Like the frosted glass, they provide a bit of privacy. Clear glass doors are for people who like bathing with a ray of sunshine coming in. Pick one that suits your style best. Besides choosing between style types, also consider its quality and safety. You can check for tempered glass certifications. One is from the ANSI or American National Standards Institute or its European counterpart, EN. Weigh between framed or frameless doors. You will eventually hear about framed and frameless doors when you go shopping. It is better to first understand the differences. Framed doors have metal frames around the door’s perimeter. They are usually aluminum or coated ones. Besides the seals, framed doors are equipped with a magnetic hardware that provides a water-tight fit. This means that they have better chances of stopping leaks whether the door is placed near the shower or not. On the other hand, frameless doors rely on the heavy-duty glass. Sometimes, they depend on a bottom frame or track, too. A lot of people opt for frameless doors because they look clean and classy. One thing to consider, though, is to put it far from the shower. Owing to the absence of seals and sweeps that framed doors have, these doors have weaker chances of keeping water where it belongs. Now that you’ve learned the basics of bathtub doors, you can use this knowledge to get more information about designs that are available on the market. Some stores let you pick more specific details. These aspects include the make of tracks or handle design. Looking into these specs will already be a walk in the park after getting the nitty-gritty. Some of us do not have the time to creatively imagine the perfect bathroom. Looking at trends might come in handy. The Hottest Top 10 Bathtub Doors Right Now! This tub door features a frameless door that is curved to add to a sophisticated look. A clear glass and chrome-coated handle and hinges give it a clean feel. The walk-in opening is also stylish. The handle can double as a towel or clothes hanger. The frameless sliding bathtub enclosure gives a clean uniform look but does not sacrifice the tile art on the bathroom wall. Equipped with glass water- and stain-proof coat, it is functional as it is artfully modern. The clear frameless glass door design accented with brass hinges and handle gives a modern and unobstructed look of the bathroom. 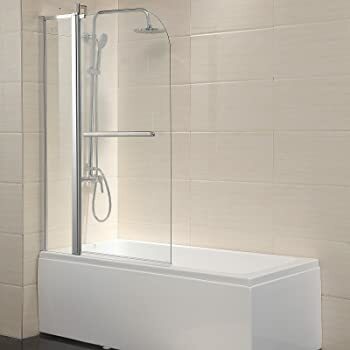 It features a hinged type enclosure that suits a short tub length. The walk-in opening eases access in and out of the tub. This door proves that clear glass types are not kings of modern designs. The rain type pattern adds to the comforting feeling akin to an in-house relaxed and cozy day. Durability and a seamless design are properly melded with the semi-frameless glass feature. Stylish tracking gives a clean design & watertight bath and prevents soap build-up. This eases maintenance burdens. 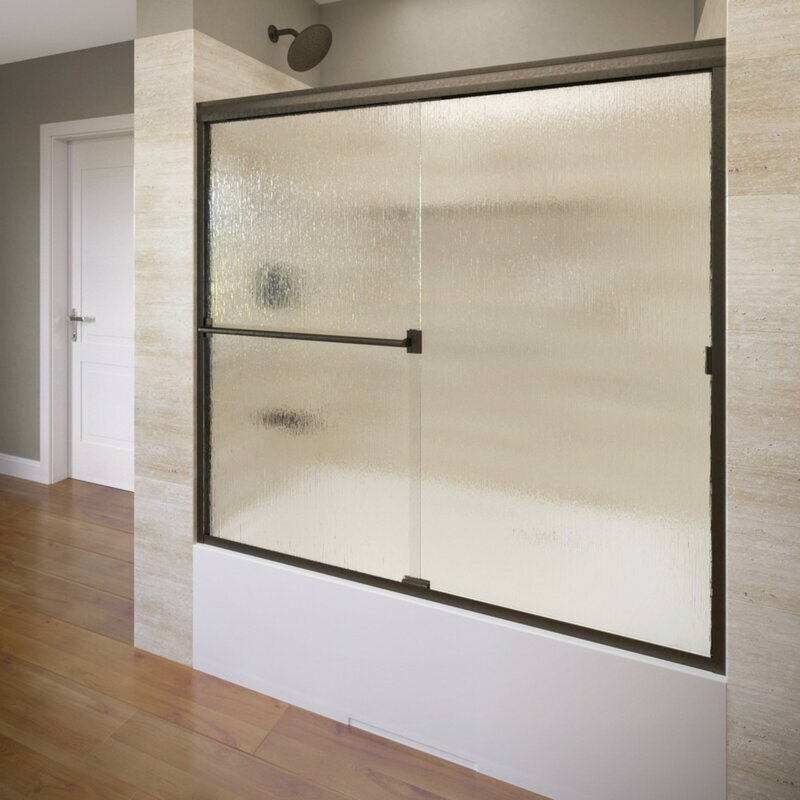 The clear bathtub glass door is a robust, hygienic, and prettier alternative to shower curtains. It serves as a shower screen without giving up a clean and sleek display of the bathroom. You can choose the hinge finish — stainless steel or polished brass, and so much more — which complements your existing bathroom hues. 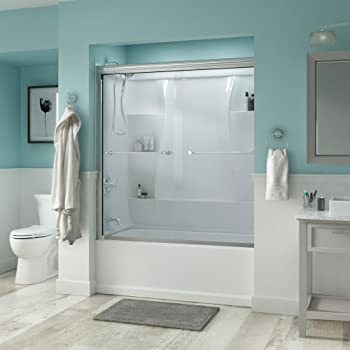 This tub door features a framed clear glass design with a brite silver finish. Door handles can double as hangers. Focused on simple form and function, this bathtub sliding door requires less maintenance. It is durable without forfeiting a calm, neutral, and balanced feel. The semi-frameless design of this bathtub door combines sturdy and style. It provides full protection against water leaks. 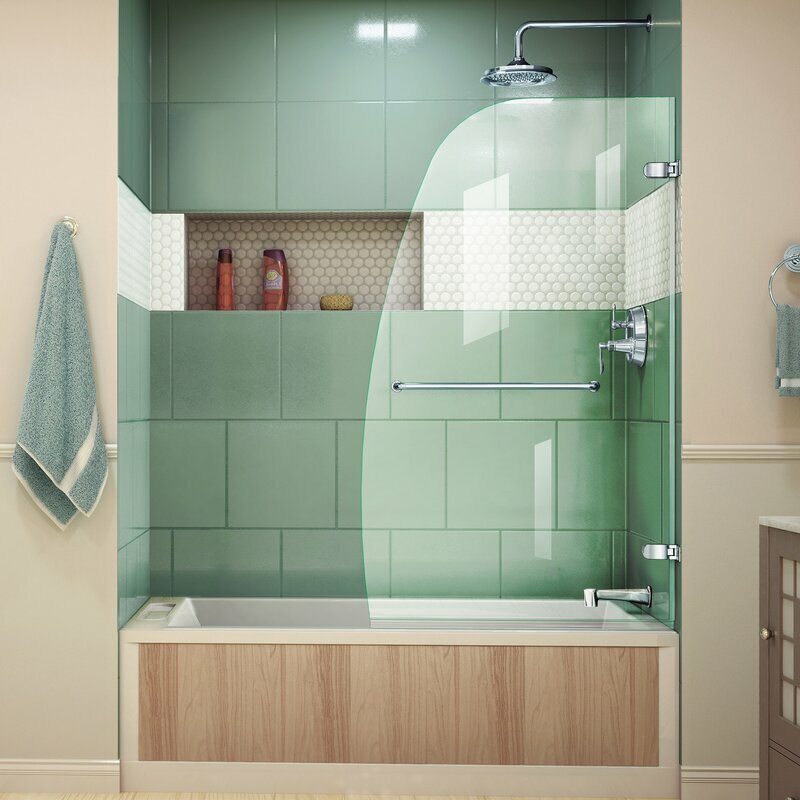 But more than its aesthetic appeal, this tub door is armed with a special glass coating that repels those annoying water spots. Cleaning becomes swift and hassle-free. While the curved clear glass-styled shower enclosure is becoming a fad, this tub door does not fall behind. It brings more bang to your buck. The clear semi-frameless hinged door is secured by a stationary panel. This makes the door strong and sturdy. Best of all, the door is made up of safe glass and high-quality chrome finish. This bathtub glass door features a unique bi-fold design. The semi-frameless clear glass style gives out a contemporary sleek look. This style gives a large breathable feeling to your bathroom. It is functional as it is aesthetically pleasing. 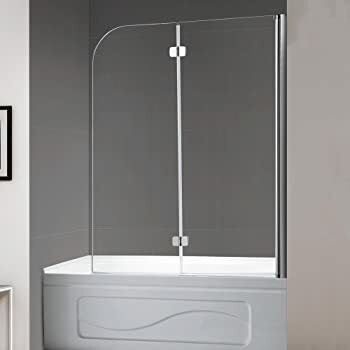 This unique frameless clear glass bathtub door not only keeps bathroom floors dry by stopping leaks. It also acts as a wall with which you can hang your clothes and towels. 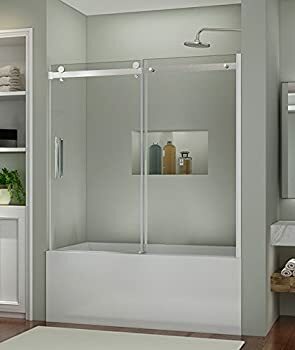 Equipped with a metal hinge, handle, and button hangers, this shower enclosure provides a crisp modern look. This entry falls easily in the roundup of best bathtub doors. 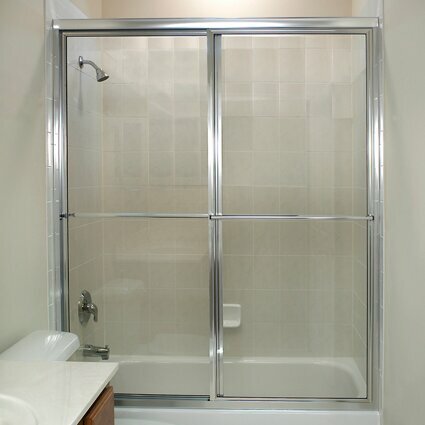 Bathtub sliding doors save space while providing full-length bathtub screen to stop leaks. Choosing the best bathtub doors considers a lot of specs in both the functionality and aesthetic aspects. In terms of performance, the ability of the shower door to stop water leaks is one of the most important concerns. A tempered glass should not be overlooked, too. Aesthetically, aspects on the metal finish and glass type are among the prime points. They are necessary to give off a clean and calming feel to the bathroom. This is why entry Number 5 (Ark Showers Hinged Frameless Tub Screen) of the lineup makes for a worthy buy for your buck. Besides the modern sleek look it creates, it is sturdy and functional. The L-shaped frame boosts stability which the two-hinged glass door entries above may lack. Also, not all tub doors have the special coating. The water- and stain-proof coat in this winning door makes it almost maintenance-free. So, if you are looking for a useful door that does not give away a lot of money and a lot of stress, this should be your top pick. And remember, it pays to do a little research before you spend. Reading bathtub doors reviews might help you decide.